The Carpenter's Ministry Toolbox: CONFIRMATION: Need a culminating project idea? CONFIRMATION: Need a culminating project idea? I'm always looking for creative ways to have kids share what they believe. I've had them do "Journey of Faith" posters. I had each student design one to be printed as an 18' x 24" size. In Powerpoint or as a Google doc slide, the slide should be 8.2" x 11" and saved as a pdf to upload well to Short Run Posters. This site will print them for $3 each. 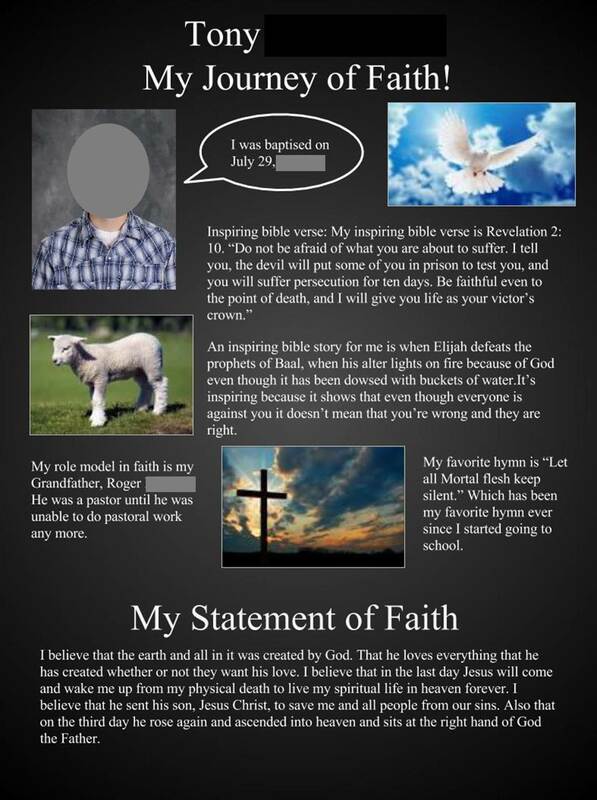 Below is a sample done by a former student of mine. I have to say, parents LOVED these! What they need to include. How many slides they need. How many words they should use. What music they may include. Here is a sample of requirements that may help you out. Check mine out. I used the music provided by the program. VBS: It's time for a CHANGE!